London’s National Gallery's landmark exhibition, “Monet & Architecture," is the first exhibition chronicling Claude Monet’s career through his paintings of architecture, from humble coastal villages to ostentatious halls of government. 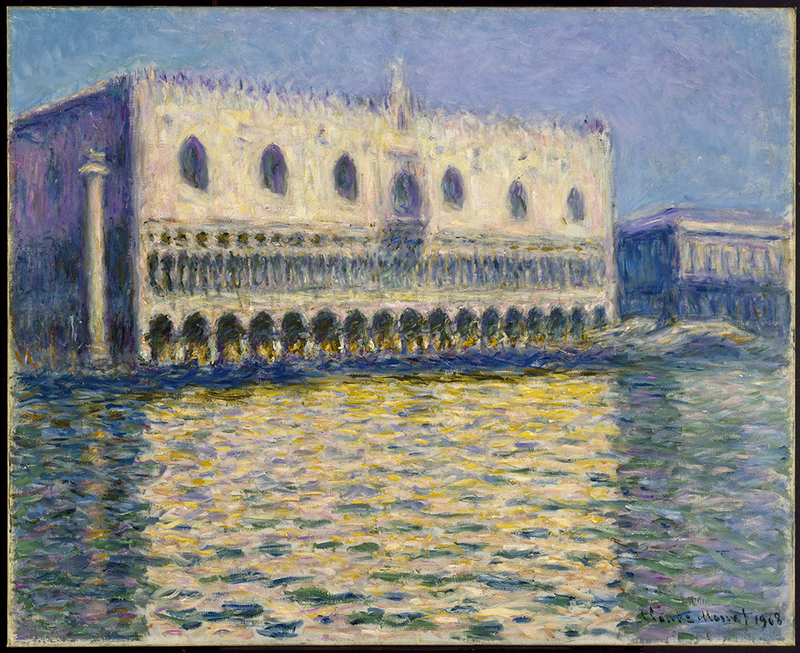 “Monet & Architecture” features more than 75 paintings by the leading impressionist artist. Richard Thomson, a fine arts professor at the University of Edinburgh, curated the show. In anticipation of the exhibition, the National Gallery released an animated trailer that sends the viewer soaring over the artist's compositions, rendered three-dimensional in a kind of paper-cut, handmade aesthetic. Monet described his unique approach to architectural scenes as based on the desire to “paint the air that surrounds the bridge, the house, the boat – the beauty of the light in which they exist.” The architectural subject matter and the encircling environment are tied together in a mutually supportive relationship. With a career spanning from the mid-19th century to the early-20th century, the artist’s work effectively illustrates Europe’s Second Industrial Revolution and its radical reshaping of urban and agricultural life. Reflecting the societal shifts contemporary to Monet, the exhibit is divided into three sections– “The Village and the Picturesque," "The City and the Modern," and "The Monument and the Mysterious.” Urban ensembles, such as his numerous depictions of London’s smog-sodden River Thames and the Palace of Westminster, highlight the glaring contrast between historical scenes and the encroaching impact of modern society. Of the work displayed, more than a quarter are on loan from private collections across the globe. While the National Gallery possesses its own Monet collection, the museum coordinated with a broad range of institutions, such as the Brooklyn Museum and the Cleveland Museum of Art, to put the exhibition together. “Monet & Architecture” runs until July 29, and is located in the Venturi Scott Brown designed Sainsbury Wing. 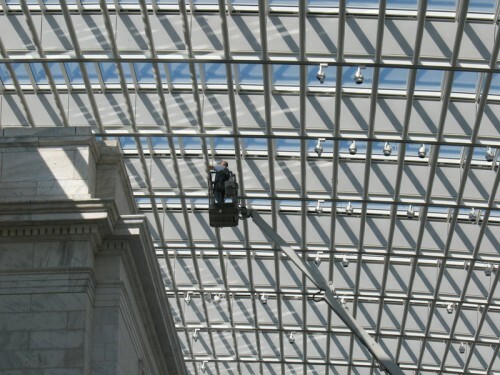 After seven years of construction, during much of which visitors were sent on an underground detour, the Cleveland Museum of Art’s expansive atrium opened in late August. The 39,000-square-foot Rafael Viñoly-designed atrium is essentially a massive skylight, which arcs from 55 to 66 feet in height across a space nearly as large as a football field. Planting beds complement the granite floor, anchoring an airy space that houses a second floor mezzanine and could seat upwards of 700 people for events. The space envelops the museum’s original 1916 white marble building and is is the principal component of a $350 million expansion and renovation project he planned for the museum ten years ago. More galleries in the new West Wing are set to open late next year. Though already open for visitors, the atrium won’t have its official celebration until October 28. The addition is cause for celebration among gallery-goers and Clevelanders in general, who can count the atrium among the city’s largest public rooms. It’s also a positive sign for the museum’s neighborhood, University Circle, which has enjoyed a resurgence in recent years. Brian Ulrich: Copia—Retail, Thrift, and Dark Stores, 2001–11 Cleveland Museum of Art 11150 East Boulevard Through January 16, 2012 Using only a hand-held camera, photographer Brian Ulrich captured the fluctuating economic climate’s impact on American consumerism in the last decade. 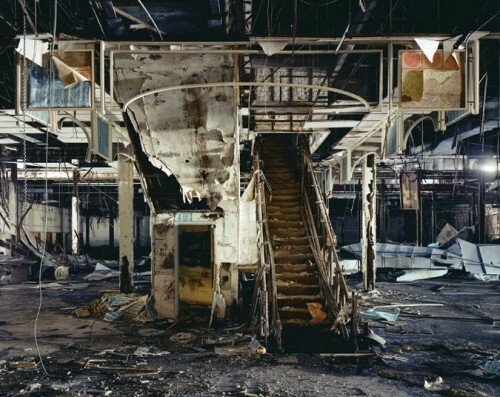 Brian Ulrich: Copia – Retail, Thrift and Dark Stores, 2001–11 at the Cleveland Museum of Art features 50 color photographs, portraying anonymous commercial excess in three distinct venues. Whether engrossed by the saccharine colors and limitless temptation of big box stores or by the discarded whimsies of thrift shops, the photographed subjects are caught in a vicious cycle of spending. The final phase highlights the absent consumer, focusing on the prevalence of ghost stores and dark shopping malls as a result of the 2008 financial crisis, such as J.C. Penney, Dixie Square Mall (above).